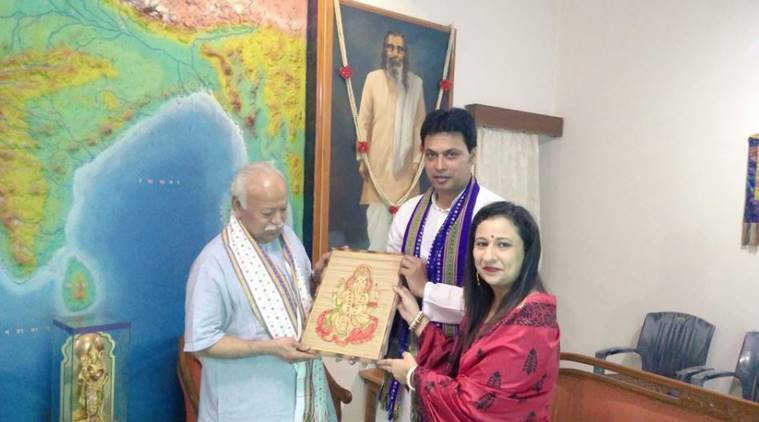 Biplab Deb, who visited Nagpur on Tuesday to meet Rashtriya Swayamsevak Sangh (RSS) chief Mohan Bhagwat, said there was no demand for the NRC in Tripura. Tripura Chief Minister Biplab Kumar Deb said on Tuesday that there was no demand for a citizen’s register like the National Register of Citizens (NRC) in his state. He said it is not even a sensitive issue in Assam, where the final draft of the NRC was published on Monday with over 2.89 crore names out of the total 3.29 crore applicants in the north-eastern state. Around 40.07 lakh applicants did not find a place in the historic document, touted to be a proof of Assamese identity. Deb, who visited Nagpur on Tuesday to meet Rashtriya Swayamsevak Sangh (RSS) chief Mohan Bhagwat, said there was no demand for the NRC in Tripura. “Everything is in order in Tripura and everyone has valid papers. Hence, it is not an issue for us,” the BJP leader told reporters in Nagpur. “I don’t feel it is even a sensitive issue in Assam and its chief minister is capable of handling the situation,” he said to a query. Some people in politics having “foreign mindset” were trying to vitiate the atmosphere, Deb alleged. The NRC contains names of Indian citizens of Assam. The Congress on Monday had questioned the non-inclusion of over 40 lakh people in the final draft of the NRC, alleging that it was a “motivated” action under the BJP which was trying to play “politics of polarisation”. West Bengal Chief Minister Mamata Banerjee had also expressed concern over the exclusion of over 40 lakh people in the final NRC draft, saying those “Indian citizens have become refugees in their own land”. Asked about his visit to the RSS headquarters, he said, “Every swayamsevak has the admiration and curiosity for Nagpur and I have come to seek blessings of the Sarsanghchalak.” Earlier in the day, Deb visited the memorial of RSS founder K B Hedgewar and paid tributes.